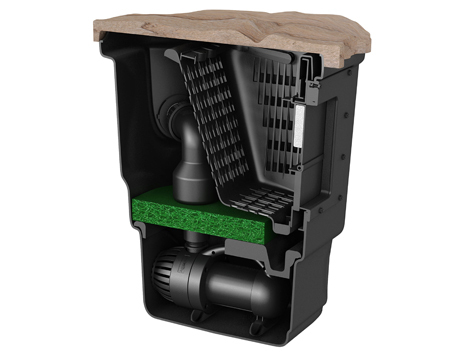 The Aquascape Signature Series 1000 Pond Skimmer provides efficient mechanical filtration for your pond. Ideal for use in ponds up to 1000 square feet, the Skimmer removes unwanted debris from the surface of the pond, significantly reducing maintenance and issues with water quality. Its 200mm weir with locking capability and large volume rigid leaf and debris basket makes maintenance quick and easy while its high-quality filter mat removes smaller sediment and debris. A patented adjustable faceplate allows the faceplate to be re-adjusted after installation, altering the water level as desired. Injection-molded fittings allow the check valve to thread directly into the skimmer wall, providing a professional watertight seal along the back of the filter. The natural-looking faux-rock lid includes grooves designed to help make the filter easy to hide into its surroundings and its rounded shape maximises the structural design of the filter. 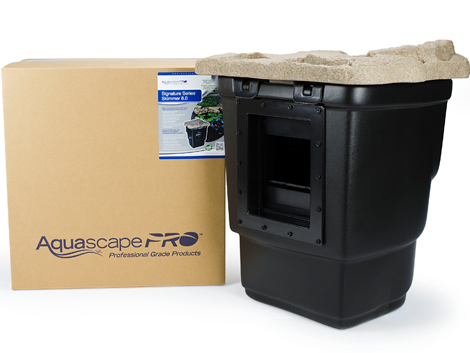 The Aquascape Signature Series 1000 Pond Skimmer is also backed by a limited Lifetime Warranty. Aquascape is passionate about the products we produce, providing unique products, designs, and features that stand above the competition.